Robbins Rehab Turkey Drive 2014! 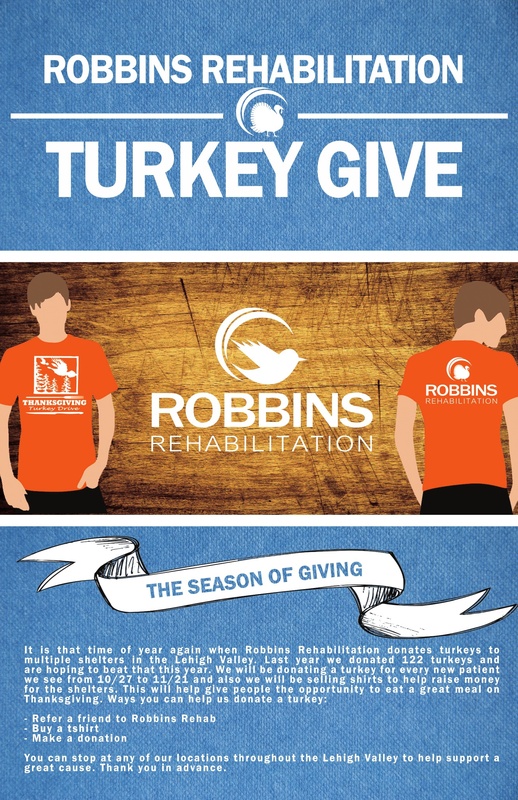 Help Robbins Rehabilitation Donate Turkeys This Year! For the past couple years Robbins Rehab has donated turkeys to local shelters in the Lehigh Valley for Thanksgiving. Sometimes people forget that some don’t have the opportunity to have a good Thanksgiving. We just want to make sure that we can help any way we can. For every new patient Robbins Rehab sees from 10/27 to 11/21 we will donate a turkey to a shelter. We will also be selling tshirts to help raise money for the shelters. 1. Refer a friend or family member to come see us. 2. Either stop in any of our locations or email Bryana@robbinspt.com to buy a shirt. 4. If you are hurt and have been putting off getting physical therapy, come in now so we can donate another turkey.